Une baguette s’il vous plait! The Home Bakers Challenge for the month of November was to choose any of the recipes given in the previous challenges. For a new member of the group, this was like opening a treasure trove. Which one to choose, which one to choose was constantly on my mind as I went through the lists. My mind was getting all muddled up as I wanted to try most of them. So the other best option was to go through my bookmarked list and see if any were a match to the long list of recipes. I finally chose to make french baguette. Though I didn’t follow the recipe given by Priya Ranjit for the Jan 2014 challenge, I made them using the poolish method. I had this recipe bookmarked for over a year! Sometimes the exotic names in itself seem daunting. 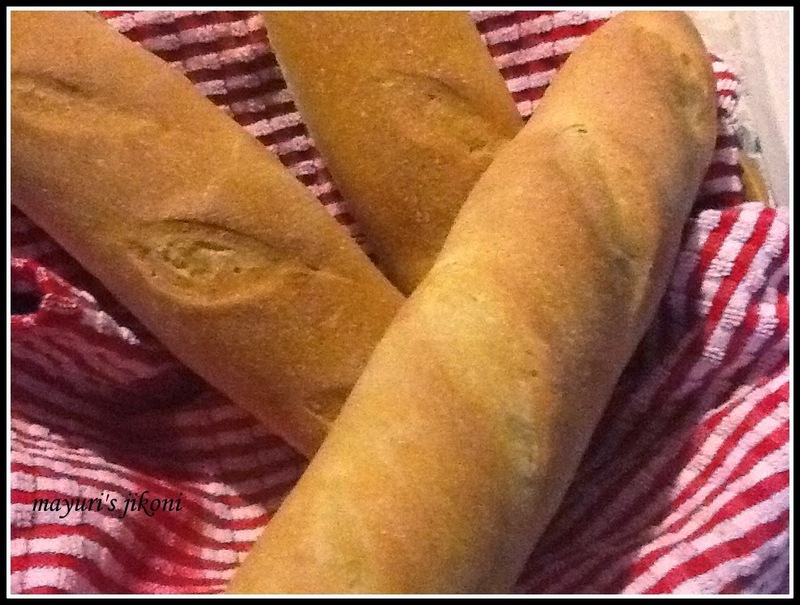 Though the method was pretty simple, I didn’t think I could bake a baguette. However, I did and am so glad I chose this recipe. Already the poolish is fermenting for the second batch of baguettes. Poolish , biga, sponge is a preferment which is used in bread making. A part of the flour, liquid and little yeast is allowed to ferment for a longer period to allow the yeast, enzymes to work on the starch and protein. This in turn improves the flavour, texture and keeping time of the bread. When we had spent some time with my daughter in law and her family in Chevreuse, her father was teaching my daughter how to ask for bread in french whenever we went to the boulangerie. The bakeries in Chevreuse were very cute and traditional. The variety of breads and pastries was mind boggling. We found it very difficult to choose which pastry we wanted! I wanted all!Ahh at that time who really cares about calories…. not me! Mix the flour, yeast and water in a bowl. Cover and keep in a warm place to ferment overnight or for 12 -16 hours. In a big bowl mix the flour, salt and yeast. Add the water to the poolish to loosen it up. Add the poolish to the flour and initially mix with a spoon. When the flour is incorporated well into the poolish mixture, turn the dough onto a floured board. Knead the dough for 15 minutes till is smooth and silky. Form the dough into a big round ball and put it in the greased bowl. Cover the bowl with a cling film and place it in a warm place. Let the dough rise for 2 hours or till it is double the size. Gently knead the dough and divide it into 3 parts. Form balls and cover them with a cling film or tea towel. Let the dough rest for 20 minutes. Take one part of the dough. Dust the board or work top lightly with flour. Roll out the dough into a 8″ X 12″ rectangle. With the longer part towards you, fold the top and bottom ends towards the middle. Pinch the ends to seal. Repeat step 14 again. By now you will have a long tube like shaped dough. Taper the ends and seal. Place the shaped dough on a greased baking tray or stone. Repeat steps 14 to 16 with the remaining dough parts. Let the shaped dough rise for 60 -90 minutes. Preheat the oven to 200°C.Place an empty baking tray at the bottom of the oven. Take a sharp knife and score or make diagonal slashes. Brush the top with water or egg wash. When the oven is hot, take some water and a few ice cubes. Put this in the heated tray. Immediately put in the risen dough. Be careful as there will be hot steam created by the water and ice. Bake for 25 -30 minutes till the tops are golden brown. Remove the baguettes from the oven and let it cool on a wire rack. Serve with soup, salad, curry or use it to make sandwiches. Brushing the tops with water makes the crust a bit chewy. Steam helps to keep the crust soft and allows the bread to expand during the first few minutes of baking. During this time the gases expand rapidly and the yeast has a final burst of activity called oven spring. The steam on top of the bread dissolves the sugars on top.It begins to caramelize to create a golden crust once the expansion of the dough stops. Egg wash is egg mixed with 2 tbsp of water. Do you find learning a new language difficult? Perfectly made baguettes ..got to try them sometime. perfectly made bread, looks nicely done..